Enterprises operating in dynamic business environments are exploring comprehensive IT solutions that allow them to track, measure, and monitor diverse aspects of their business, improving and streamlining the entire spectrum of operations. Epicor comes into the picture to elevate the game in terms of industry-specific solutions that underpin greater efficiencies and productivity, helping customers to outflank competition. Being highly flexible and scalable, Epicor’s ERP solution caters to enterprises’ unique operational requirements with a varied range of deployment models that include both on-premise and cloud-based versions. As the drivers of growth, Epicor facilitates rapid deployments, enhanced levels of agility, and a much quicker time to value for IT-intensive enterprises. Epicor delivers a wide array of responsive solutions for customer relationship management, supply chain management, human capital management, and financial management among others. In addition to guiding enterprises on how to expand their product lines and enter new markets, Epicor’s worldwide support for product management, development, and extended services help enterprises address the real world impediments in a hyper-competitive marketplace. Also, Epicor has an extensive network of authorized consultants and partners who offer implementation and professional consulting services. By delivering highly integrated, preconfigured, and automated solutions, Epicor partners enable their clients to develop and execute winning strategies. In the last few months, we have evaluated scores of technology solution providers and selected the ones that are at the forefront of tackling challenges in the Epicor solutions arena. The companies listed in this issue have exhibited comprehensive know-how and in-depth expertise in delivering a varied range of services. 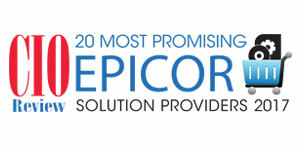 In this edition of CIOReview, we bring to you 20 Most Promising Epicor Solution Providers 2017 featuring the vendors redefining the Epicor landscape.